Through this website I will share my arcade game collection and show you how I restored these beauties. Are you interested in building your own arcade cabinet? How about restoring a classic video or electromechanical arcade game? 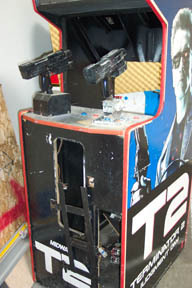 Restoring a Pinball game? Build a rare classic game from scratch? Maybe you just want to repair a game you have that is not working? How about creating your own unique game? It is easier than you think. I can show you how. Restoring old games is not only fun but educational. If you have an older game or a new video game, you may have already wondered what you will do if it stops working. Maybe you picked up a game at an auction or online and hope to restore it but do not know where to begin. I have restored countless games and am now offering a how-to video series that explains exactly how you can do it too. The videos will eventually include everything from MAME conversions, to Classic Restorations, Electromechanical restorations, and even conversion of non-working games to new and different games. Check the Video/DVD link to find our how-to videos and information on restoring games. Check out the Cabinets link to see some of our past projects. 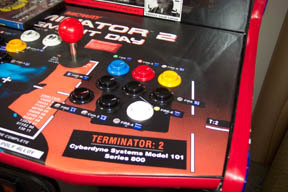 Our latest video is the Terminator 2 Multi-Console Conversion project. 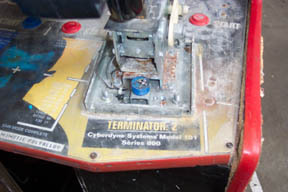 We take a gutted Terminator 2 arcade game and convert it into an X-Box/PS2 based system with light guns and a full control panel. It was one of the easiest projects we have undertaken and it has also turned out to be one of the most fun games to play. We are now editing together a number of other videos. Let us know which you are most interested in by visiting our survey page on the right side of this page. Which Restoration Project Video Do You Want To See Next?